Plumbing is an integral part of remodeling. The mechanical components of a remodel are as important or more important than the expensive cabinets and faucets which we get to see. An improperly installed shower pan or leaking pipe can require a project to be entirely redone. 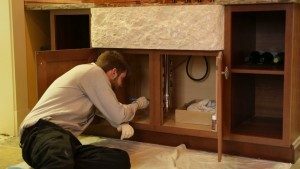 Being that plumbing problems are often inaccessible and can ruin a very nice remodel or cabinets, it is very important to qualify a licensed experienced plumber for your remodel. Confirm with your contractor that the plumbing in your house will be serviced or replaced by a licensed and insured individual. We guarantee our plumbing services for one year after installation on fixtures provided by us. If there were a problem with a faulty valve that we supplied that started to leak after 3 months, we come out and take care of it. We can offer this guarantee because we have confidence in our technicians and abilities as excellent plumbers. We offer remodeling services in addition to our plumbing service because of the plumbing skill required to properly fulfill a renovation that will last the test of time. Just as we have been doing for over 100 years. This entry was posted in General Services and tagged qualifying your contractor. Bookmark the permalink.